Traveling has evolved into a passion for me in the past few years and even though I dedicate every single day of holiday from work into it, I am still only able to see tiny bits and pieces of what our planet has to offer. I want to see much more and go to faraway, adventurous and exotic places. This ain’t something I should do as a dad, so it’s time move soon and find a good way to manage the mammoth project! Check out this entry to find out more and share any advice you might have! I will turn 30 next June and even though I don’t really care about that number in general, it reminds me of the fact that I’m not getting younger and that I need to make a move soon. After all, I’m also very much looking forward to have a family and settle down and as soon as this day comes, I won’t be able to travel as free and independent as I can now – so there is no other logical choice in my eyes. 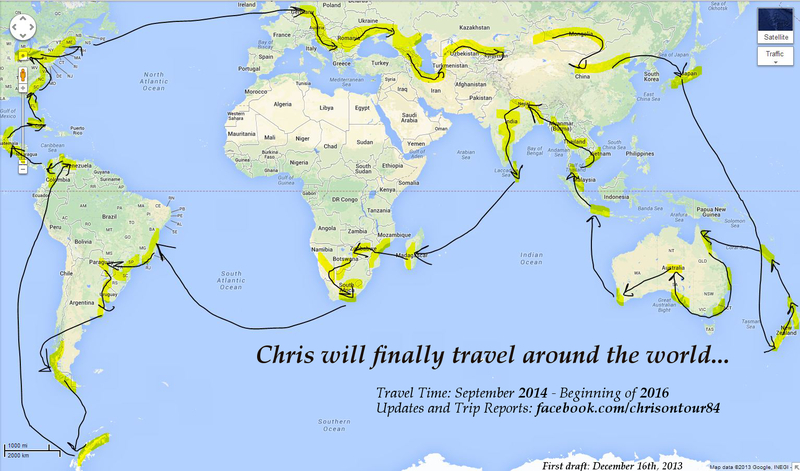 I was actually starting to put the major stops into Google Maps, but by the time I reached Asia I realized that this will just be too many of those and I decided to dig out good old MS paint to create the map above. It is just a first Idea and I’m sure many drafts will follow, but I already like the idea to travel the world in an actual kind of circle without wasting any time going in between places. Now I need to figure out which direction to go in order to not run into any unpleasant rainy seasons etc. and I will start doing research on that soon. If you have any general advice on how to arrange the order of the stops and areas that I should not miss along my route, please let me know by posting it in the comments here. Thanks a lot and I will keep you updated – this Blog will certainly grow much bigger by the time I actually start traveling without going to my regular work anymore! versuch in die mongolei ab mai zu kommen, herbst bis frühling ist die landschaft ehr trostlos weil viel steppe… ab mai beginnt die “regenzeit” dann ist die steppe richtig grün blüht auf, ulan bator lohnt sich nicht wirklich, aber landschaftlich drumherum ists schon geil, motorradtouren durch das gelände bieten sich an, war leider geschäftlich in der mongolei und konnte nicht sehr viel machen außer im umkreis von ulan bator mir was anzugucken…. Du bist verrückt!! Aber mach es, unbedingt!! Ich freu mich schon auf Deine Reiseberichte … der von Schweden war der erste, über den bin ich eigentlich hier “hängen geblieben”. Warum schreiben Deutsche ihren Reisebericht auf Englisch!? Ich werde es nie verstehen. Gerade im englischen Sprachraum gibt es so viele Tagebücher, die um Klassen besser sind, als dieses hier. Warum will man sich ausgerechnet mit diesen messen und macht nicht lieber ein eigenes in seiner Muttersprache? What a wonderful trip you have planned ! My son who is about you age is leaving Australia to live in London for a few years , might get him to contact you for some travel tips ! The best time for a visit to Melbourne would be from November to March when the weather is warm . Look forward to reading your next trip reports.? Glückwunsch zu Deinem Entschluss !!! Ich habe den gleichen Entschluss vor einigen Monaten gemacht und bin nun schon seit knapp 10 Monaten unterwegs … und ich habe diesen Schritt noch mit keiner Sekunde bereut. Allerdings kann ich Dir nur den Tipp geben nicht zu viel zu planen – es kommt eh meistens anders. Lege Dir einen groben Plan und mögliche Reiseziele / Regionen zu Recht und dann starte einfach Deine Reise … die Spontanität und die Freiheit ist zumindest das, was meine Reise für mich selbst so besonders macht. Why not through Turkey? It’s a lot saver than Romania for example. And Turkey is the place to be booming now with everything. It’s one of the best countries in the world if you want to take pictures. Enormous amount of historical places too. Some tips on your map: you have “neglected” some really cool places of the world- have you been in most of Europe already, and thats why you dont choose to visit? If so, ok. If not ,please re-consider your route! I am from Greece and ofcourse i have lovely places to reccomend if you havent been here or if you do decide to visit, but apart from Greece i would reccomend Morocco(friend of mine been there and loved it) and Egypt. Also, Germany and Austria dont have big differences between them( neither in scenery or culture), you also plan on Iran, Turkmenistan, Uzbekistan, and Kazakstan( think:P)…again same situtation. I am not saying they are completely the same, but do you choose 3-5 very very similar countries! Last but not least i dont think Romania is unsafe, its just this unclear idea about the Balkans that people have. Its a lovely country with a flourishing Balkan spirit! Well done dude! It is really cool that you are doing this! the posts are very entertaining!